I just returned from a 6-night stay at this resort for a friends vacation. The staff was amazing! So helpful and generous. In particular, Vikas, the manager of the Vista restaurant, was very helpful with ideas, advice, and even helped us find another part of the sort. Jeffrey also was exceptionally helpful and welcoming to us. The rooms are comfortable and elegant. The pools are very relaxing, especially with the views! The food also was very good. The only criticism is that the resort is a bit difficult to navigate. However, we found out it was designed like a traditional Thai village, so now it makes a little more sense. It would not have stopped me from staying there and my friends and I had some fun getting around the resort. The shuttle service to Bangla Walking Street and Patong Beach area was a quick trip and very convenient. This hotel is amazing. The staff went above and beyond to make this a holiday of a lifetime. All 3 pools were fantastic. The food was fab and location great to main town Patong with free transfers. Will definitely be going back! According to many excellent reviews on TripAdvisor and in order to go to Freedom Beach, so we decided to stay in this resort for 2 nights. The facilities are perfect, that including three swimming pools in different areas, spacious hotel room and clean bathroom for our well sleep. Some problems were that I dialed 0 to front desk but no one answered and for a long time. I was wondering why the map of resort was written by receptionist if you had any questions to dial 0. But it’s no way, which made me feel very sad. And there was not enough staff in buffet breakfast, no staff at the entrance to lead for guest seats, even if a few guests at 7:30 a.m. The chopsticks was under-supply, we had to ask staff to provide. We just looked at the main chef was hard working around the restaurant. Anyway, the quality of the food was ordinary and not many kind of food. We stayed at Avista Hideaway for a week and we did not want to leave. Everything was beyond perfect. The hotel was super clean and stylish, they really think of everything to make you comfortable and happy. Both restaurants in the hotel are one of the best restaurants in Patong, so we ended up eating in the hotel quite a few times. The swimming pools are amazing we could not even choose a favourite as all three are really nice. Now the best of all was the service, all the staff are really lovely we fell in love with all of them. Super recommend it it's definitely a 5 star hotel, you won't be disappointed. Stayed here for a week, Rooms are nice and clean, with a friendly and warm accommodating staffs but the highlight of all is the the warm service of our favorite in Sizzle rooftop extending our special thanks to Reyand who always give us warm smile and excellent service. This was family vacation.We booked 2 rooms and stayed for 5 nights with my 80 years old parents.the Charles at reception is friendly and attentive and accommodated us by the elevator that much easy for my parents up and down the stairs. We take all the breakfasts and 3 dinners in hotel during we stayed.food and service are good.the staffs are smiling all the time.we ere really enjoy our stay. We will back again. We wanna say thank you again. We have good memories there. Nice cosy place... We stayed in a Deluxe Pool access room, which was very spacious & comfortable. Parinay was very helpful to check us in & take care of our needs / queries. The Spa is worth visiting. Hotel is close to Patong Beach (pay THB 300 away by taxi or take the complimentary hotel shuttle), yet away from the hustle bustle. Would stay again. We spent 5 nights at the Avista Hideway Phuket, in a 1 bedroom executive suite with a private pool and we could not fault the resort. Our stay was right in the middle of Thai New Year / Songkran (unplanned!) Traveling with my wife and 9 year old son, our accommodation had to be clean, modern and family friendly. And this resort achieved all 3 quite well. 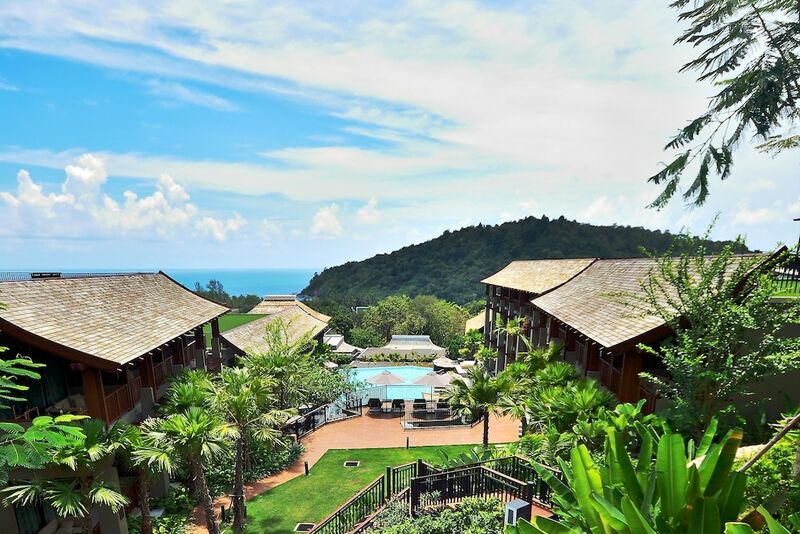 The physical location plus the views of the mountains in the backdrop and Andaman Sea were breathtaking. Patong beach and the main tourist strip were only a short taxi ride ($12-14). It was great to be away from Songkran madness. Our suite was very clean and spacious. My wife loved the makeup room area and we utilised the private pool each morning and evening! The buffet breakfast quality & extensive spread was what you would expect from the Sofitel brand. My son (and I) especially enjoyed the freshly made waffles & pancakes! There was the usual egg ordering station, plus Western & Asian dishes. The waiting staff in the breakfast restaurant were very attentive to our needs. The front desk staff in the lobby were professional and always pleasant to deal with, especially a young lady called Nan. She was a great help in advising and arranging our daily activities. Another staff member who truely made our stay an unforgettable experience was Mr. Parinay Singh. During the pre- booking process I was in touch with Parinay, and out of the 3 or 4 hotels I contacted directly for rates / accomodation requirements - he was the most professional and knowledgeable. He would answer my queries via emails & phone calls promptly. Once we checked into the resort, Parinay went over and beyond to ensure our stay was pleasant & that my family were comfortable & enjoying the resort facilities. His knowledge of the local region and recommendations of activities, tours, restaurants were very helpful. A special thanks to Parinay and the entire Sofitel team. We will definitely be back. Hope to see you all sooner than later! Freedom Beach is a short stroll from Avista Hideaway Phuket Patong, MGallery by Sofitel, and other popular attractions like Patong Beach are within a mile (2 km). This 150-room, 5-star resort welcomes business and leisure travelers with 3 outdoor pools, a full-service spa, and 2 restaurants. Enjoy dining at the resort's 2 onsite restaurants: Sizzle Rooftop Restaurant offers relaxing ocean views; Vista Restaurant specializes in local and international cuisine. Order from 24-hour room service to satisfy your hunger without leaving your room, or make new friends over drinks at the bar/lounge. For your convenience, a buffet breakfast is served for a fee on weekdays from 6:30 AM to 10:30 AM and on weekends from 6:30 AM to 11:00 AM. Guests can expect to find 40-inch an LCD TV. Along with relaxing touches like a rainfall showerhead and a soaking tub, the bathroom offers hair dryers and free toiletries. Other standard amenities include a balcony, an iPod dock, and a refrigerator. Guests of Avista Hideaway Phuket Patong, MGallery by Sofitel have access to a full-service spa, 3 outdoor pools, and a children's pool. You can take advantage of free parking, along with a free beach shuttle. The front desk is staffed 24/7 to help with luggage storage, securing valuables, and dry cleaning/laundry. Other amenities at this luxury resort include a 24-hour fitness center, free WiFi in public areas, and a conference center. Buffet breakfast is served on weekdays from 6:30 AM to 10:30 AM and on weekends from 6:30 AM to 11:00 AM for a fee. Sizzle Rooftop Restaurant - Ocean-view restaurant and bar open daily for dinner. Reservations required. Vista Restaurant - Pool-view theme restaurant and bar specializing in local and international cuisine. Open daily for breakfast, lunch, and dinner. Kid's meals available. Rendez-Vue Rooftop Bar - Bar with ocean and pool views. Open daily. VIDA Bar - Ocean-view bar open daily. The resort has 3 outdoor swimming pools and a children's pool. Other recreation options include a 24-hour fitness center. The preferred airport is Phuket (HKT-Phuket Intl. ): 38-min drive, 23.4 mi/37.6 km.